Irene Smyth, 81, and Neil Balkwill, 94, have struck up a romance later in life. Irene Smyth and Neil Balkwill laugh, wink, and share conspiratorial smirks like so many new couples, but they're not so new to romance. "I like to swim and so does Neil, and we'd be the only two at the pool, so we got to be pretty good friends," said Smyth, 81, from her home at College Park Retirement Residence in Regina. She's smitten with Balkwill, another resident at the home who's sweet on her, too. Balkwill, 94, normally swam alone until the day he met Irene. "We've become attached because we do so many things together," he said, listing off swimming, dancing, driving. "I don't know if we'd call it love; we call it companionship," Balkwill said at first of his four-month-old relationship. At that, Smyth rebuts with a wink. "That isn't what he tells me," she said as they both chuckle. "[He tells me] that he loves me and I'm his gal." "Sure, I love her. And I love it because we do so many things together," Balkwill said. "I think that's what keeps you young in spirit, is being involved. And it's nice to have a lady-friend, too, especially when you can dance together," he added. "We seldom miss a dance." No jiving, though, Smyth pointed out. Smyth said her daughters are happy for her and think her new relationship is "wonderful." Her grandson, Taron Cochrane, said he was used to talking to his grandmother every day on the phone. But around four months ago, there was a two-week stretch when he didn't hear from her, and he knew something was up. As it turned out, she was spending more time with Balkwill. "I think it's fantastic. You know these two, their lives have been incredible stories to tell in themselves," Cochrane said. He added that it can be stressful for people to worry about how they'll spend their senior years. "These two have found each other and they've got similar interests, similar personalities, and they do things they love, and I think that's fantastic." 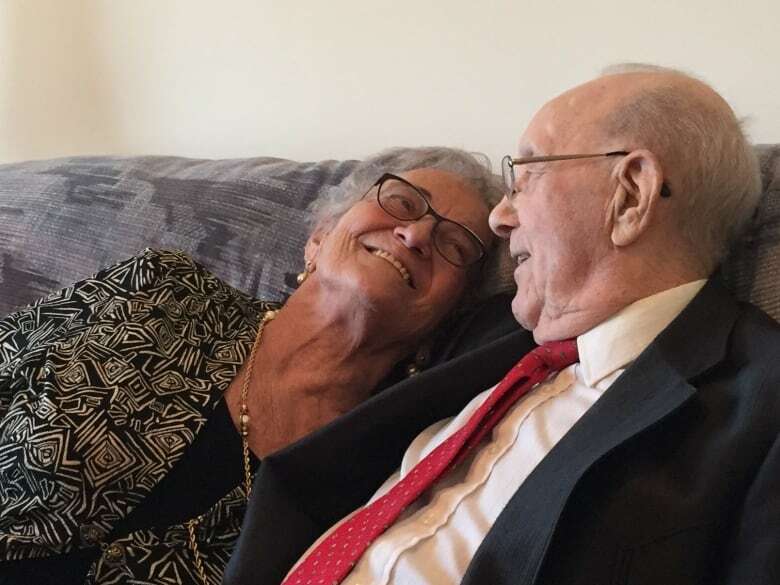 The couple offered some advice for other people over 80 who feel lonely: "get involved with somebody, then do things together," said Balkwill. "You wouldn't believe it: she comes to me early in the morning after breakfast — cold out. She's all dressed up, and I've gotta get clothes on to go out walking," he said. Smyth's advice was even simpler: "Make a good friendship that could lead to love-ship."